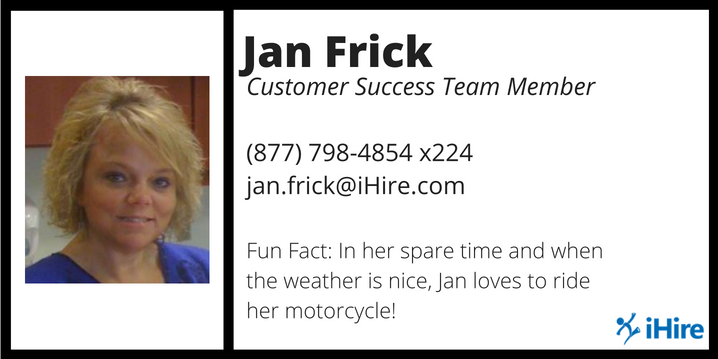 Meet your Customer Success Team Member, Jan Frick! Jan joined iHire in October 2012 and has extensive experience providing top-notch customer service in a variety of industries. Learn more about Jan and what she loves most about being a part of the iHire team. JF: My favorite thing about my job is helping people. 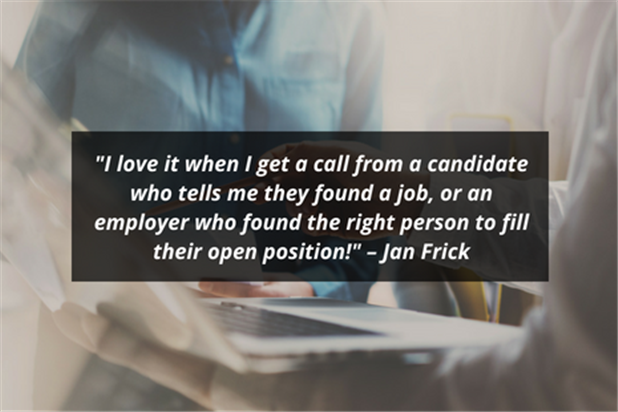 I love it when I get a call from a candidate who tells me they found a job, or an employer who found the right person to fill their open position! JF: Our great customer service sets us apart! You can actually speak to a human being who is there to help you. That's pretty uncommon in our industry. JF: I have worked in customer service for over 30 years. I started out and stayed in retail for about 10 years and then worked in manufacturing customer service for 17 years in the same position before coming to iHire. JF: I am excited to work for a company that has such a great team of people who all work together for a cause. We have so much talent in one place and we are always improving things to help employers and job seekers succeed! JF: My husband and I love to ride our motorcycle when the weather is nice. We love to travel and explore new places. I also enjoy spending time with family, especially my grandchildren! JF: I could never decide what career I wanted. I changed my mind a lot, but always knew I wanted to help people. JF: I love “feel good” movies. “Because of Winn-Dixie” and “Nell” are two of my favorites! MUST WATCH! JF: If you're looking for a job, make sure that you actually apply to every opportunity that interests you. Just posting your resume and making it searchable by employers is not enough. It is a good start, but you also need to actively apply. JF: I love to play cards and board games and put puzzles together!